Q1. Tell us useful tips in a mariage of cuisine and wine! Q2. Do Japanese wines mature well by storing in a good condition for a long time? Q3. Which wines match Nozawana (plant food fermented by vegetable lactobacillus) and Oyaki (flat baked flour or buckwheat flour bun stuffed with red bean paste or vegetable filling) ? Cooking specialist, planning and running farm houses which offer various cuisines using local foods/ One of the award winner of the 1st cooking masters by Ministry of Agriculture, Forestry and Fisheries. Foods and drinks we take are very important. The base of foods and cooking is to be healthy. As Shinshu (Nagano Pref.) is rich in foods from mountains very much and they are good, I recommend you to eat them simply. 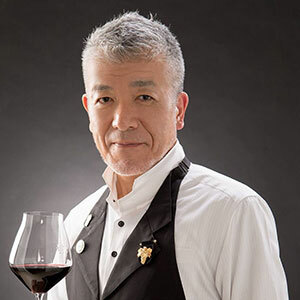 Senior sommelier (certified by Japan Sommelier Association)/ The winner of the 4th National Wine Advisor Championship/ One of the judges of Nagano Appellation Control of Nagano Prefecture and one of the founders of the control system. Wine cannot be only a leading but an excellent supporting actor. 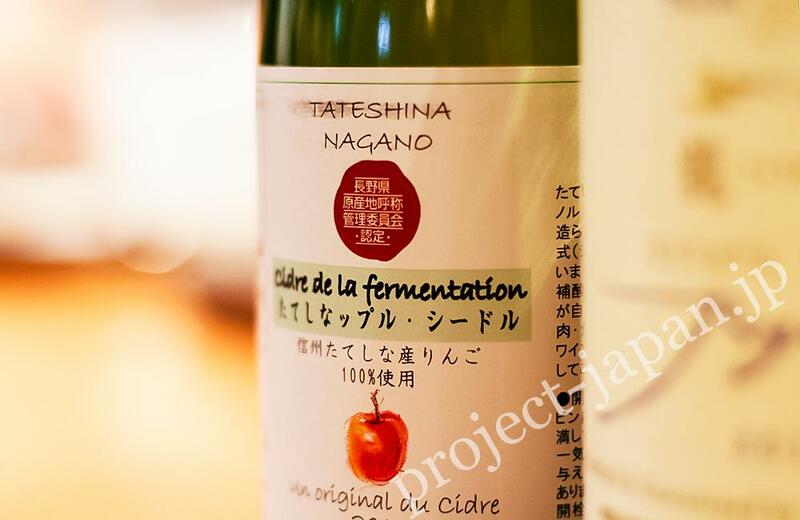 Today, I’ll offer you some good Nagano Wine which enhance the good in Mr. Kitazawa’s cuisines. “It is our proud product with no additives such as condensed fruit juice or antioxidants (sulfites). An authentic cider produced with the “Champagne method”, a traditional French process for making cider. Enjoy the clear, refreshing taste and rich fragrance spreading in your mouth. Omelet with Shinshu Hisui-Soba (jade colored buckwheat), Japanese yam and Kampo-ran (vegetarian-fed egg – feed contains 31 kinds of herbs), topped with chopped apple and yolk sauce. Not only for the omelet, I used yolks of Kampo-ran for the sauce, and put sprinkled Parasenecio delphiniifolius – the mistress of the wild vegetable – salt on it. 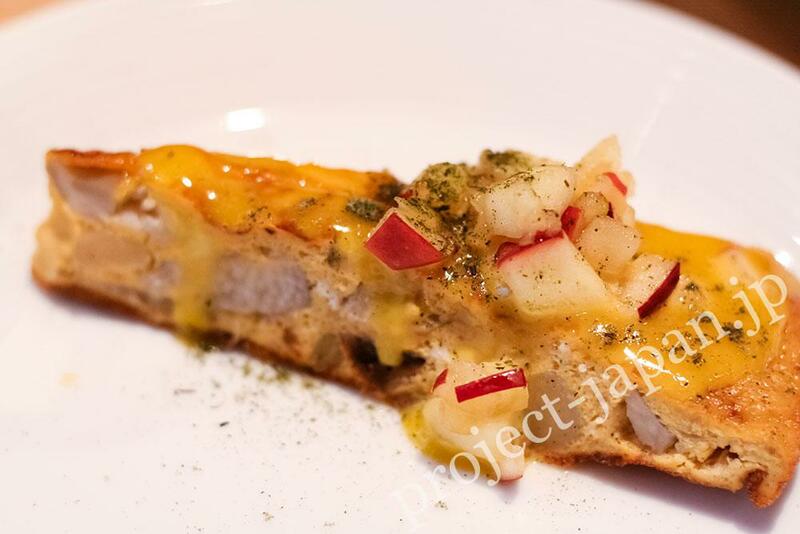 A combination of buckwheat, apple and omelet. You might imagine Mont Saint-Michel. Buckwheat and apples are one of the specialty crops of Nagano Pref., and these local specialties are similar to those of a region in northwestern France. I’m sure this cider goes very well with Mr. Kitazawa’s omelet. I used rice vinegar, soy sauce and colza oil made in Shinshu for the dressing. 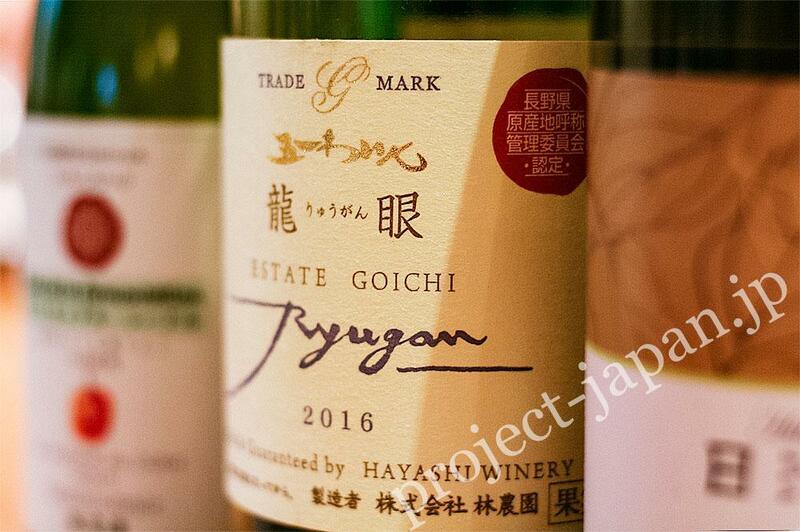 “Estate Goichi Ryugan 2016” uses a white wine grape called “Ryugan” taken from its own farm. It has elegant and fruity flavors with elements of white flowers. A little dry and crisp taste remains. 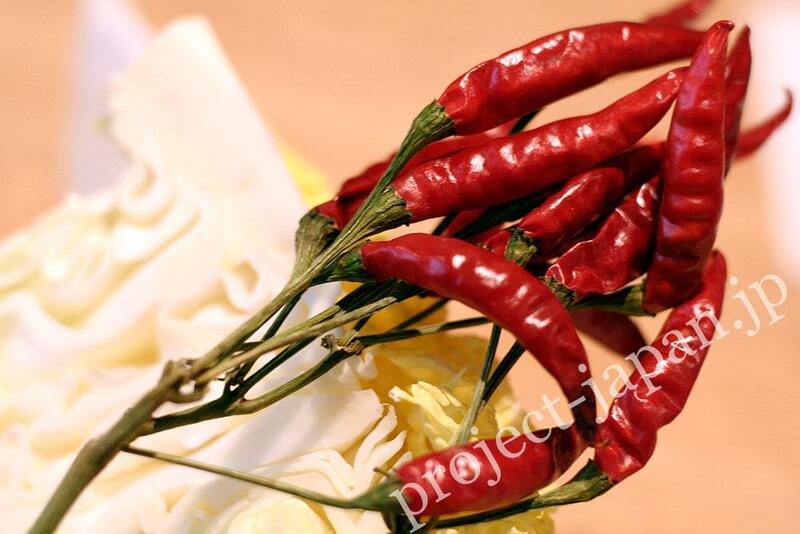 Goes well Japanese cuisines such as tempura, sashimi, grilled fish etc. HAYASHI WINERY is the first farm which planted Merlot on Kikyogahara area in 1951. 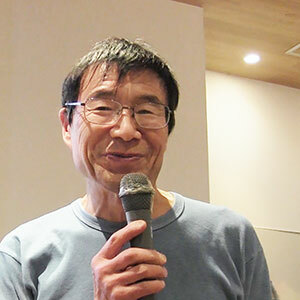 Since the founder’s name of the winery is Goichi Hayashi, “Goichi Wine” is its brand name. Won many prizes at domestic and international wine competitions. The winery celebrated its centennial anniversary in 2011. This grape has clear white and citrus aroma. Wine made from Ryugan can be drunk smoothly. Another name is “Zenkoji-Budo”, this name is derived from a tradition that Ryugan has been cultivated where the sound of the bell of Zenko-ji Temple could be heard. I don’t feel a robust wine goes well with such flesh vegetables, I selected Ryugan so that this wine stands by the dish. 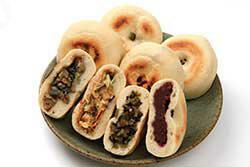 “Kazesayaka” is one of the original foods in Nagano pref. I put Braised Japanese yam remaining the crunchy texture under the risotto. Boiled buckwheat and mushrooms as an accompaniment. I used sake lees and miso made in Nagano Pref. in white wine sauce. 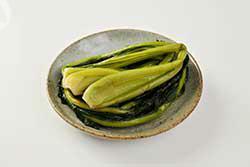 “Hitakihara”, which isn’t made from Chardonnay nor full-bodied, is better to accompany to this dish. As a sour taste is an important factor for wine, a wine without sourness is worse than anything. So far as sourness, Hitakihara is a little milder than Ryugan, and I thought this mildness would harmonize with the sweetness and smoothness of the risotto. 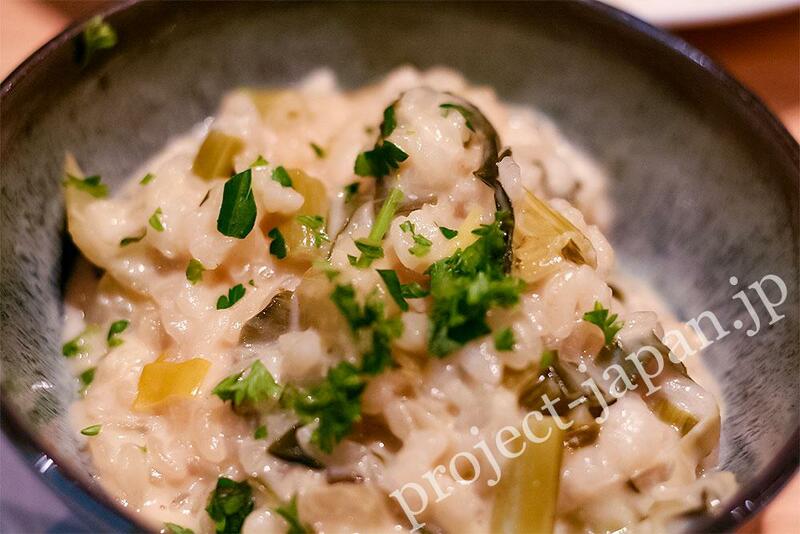 The risotto contains fine cut Nozawana and Hitakihara has aromas of herbs, you can feel a very good harmony of those aromas and tastes. I recommend you to have a nibble at these entremet vegetables raw. I grilled Shinshu Golden Shamo and burdock pickled in white wine, miso and sake lees. 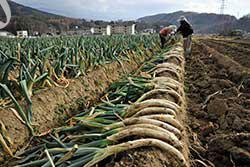 As ginseng has been cultivated in Saku area (the eastern region of Nagano Pref.) 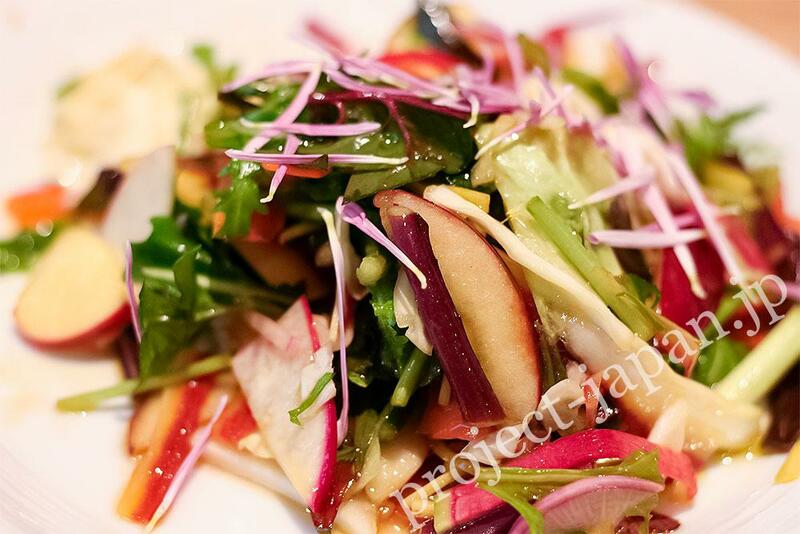 since several hundred years ago, I sauteed it with Shinano-Gold Apple which is one of the special products in that area. Also, minced wasabi is mixed in the sauce with Kamporan. This sauce goes well chiken dishes and red wine very much! 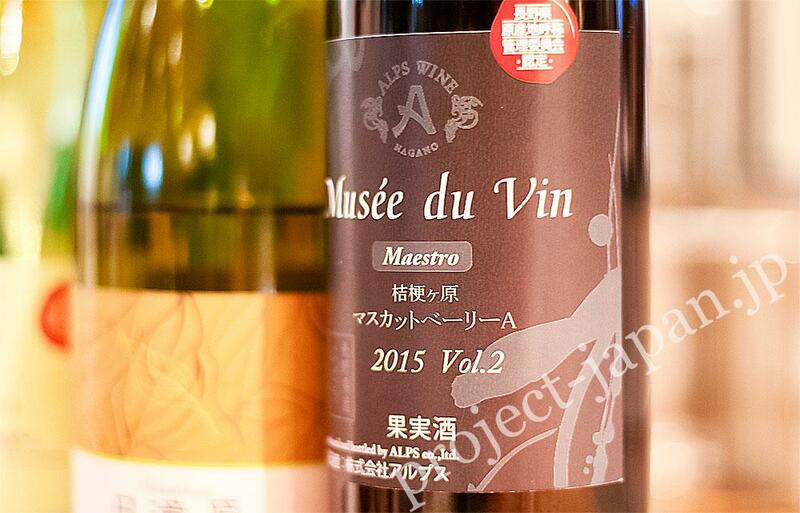 “Musee du Vin Maestro Muscat Bailey A 2015” uses Muscat Bailey A grape produced in Kikyogahara , and matured in barrels made of French Oak for eight months. Sweet, glamorous and rich smelling of berries. Has a good balance of tannic and crispy tastes. Won a bronze prize at the 14th Japan Wine Competition in 2016. A black wine grape of Japan-specific variety, registered on The International Organisation of Vine and Wine’s list in 2013. 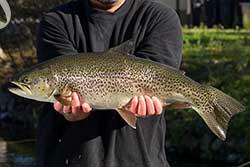 Produced by crossbreeding Muscat of Hamburg and Bailey. Has a thick and deep pink-skin. 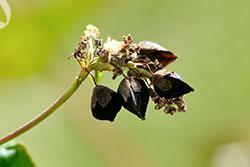 Its fruit grows large and has disease resistance. Sweet, rich and fruity taste. Recently, it’s often used for dry/ light-bodied wine. Not so tannic nor sour but round. Has an aromatic scent suggesting strawberry. 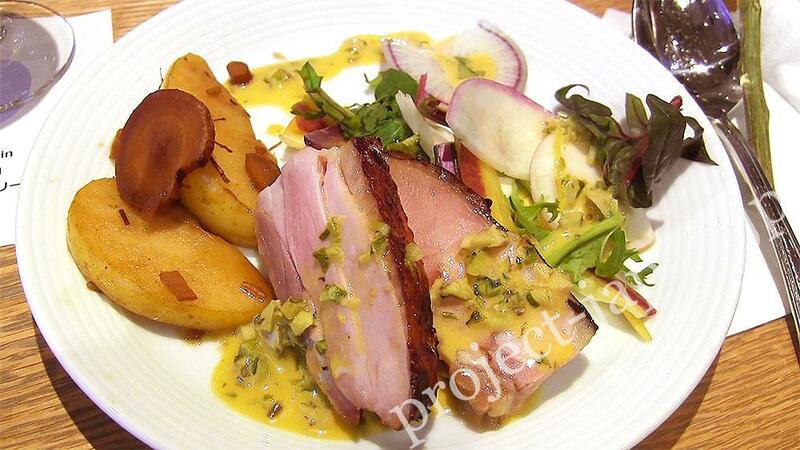 This meat dish contains burdock, I selected an earthy red wine which slightly has a smell of root vegetables. I’m sure it matches the dish. 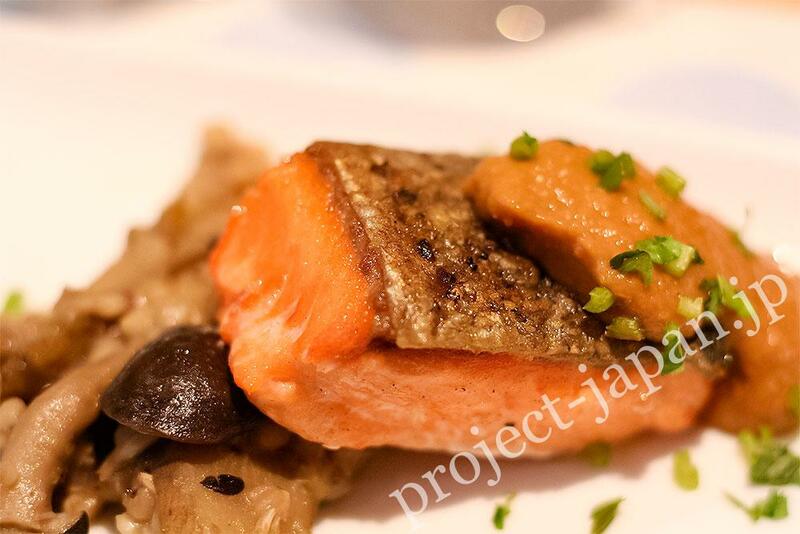 When we coordinate with a meal which is delicate and yet rich, I select a red wine made from Muscat Bailey A – not Merlot -, a representative grape of Japan. Muscat Bailey A is light-bodied and not not-so-tannic. Ichidagaki (dried persimon produced in Iida and Shimoina area – the southern region of Nagano pref.- and a special product of there) topped by sweet glaze ofchesnut taste and flour of Shinshu Hisui-Soba. Ichidagaki topped by sweet glaze ofchesnut taste and flour of Shinshu Hisui-Soba. Tell us useful tips in a mariage of cuisine and wine! The term “Marriage (pairing)” is often used for Japanese cuisine and wine or sake, more and more restaurants are serving wines which are most appropriate for meals. When you coordinate wine and foods at home, coordinate light-bodied wine with lightly seasoned dish (both fish and meat are OK). For foods using butter or cooked in well-seasoned broth, full-bodied wines go well. I’d like you to try out a marriage that looks like a difficult challenge. Wine can even match Nozawana, which has a tart taste. 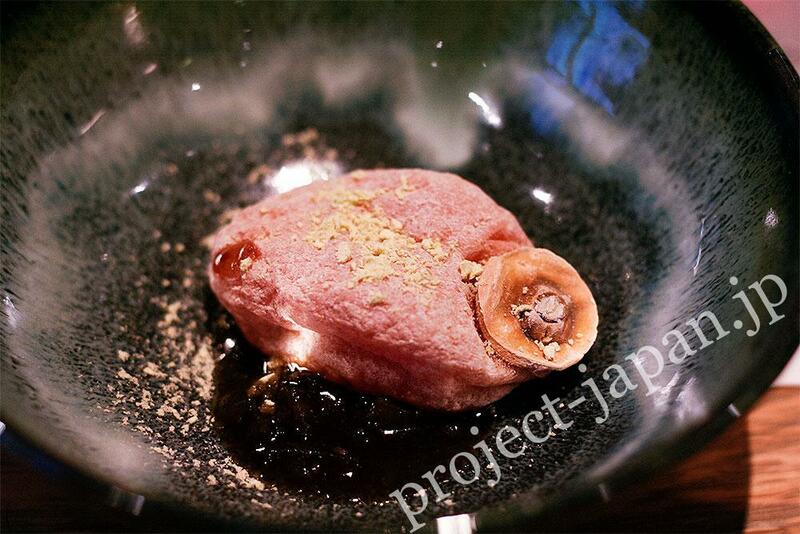 And wines which have an earthy aroma go well boiled burdock or chopped raw horse mackerel. Do Japanese wines mature well by storing in a good condition for a long time? The life of wine varies from one to another, as well as that of human. 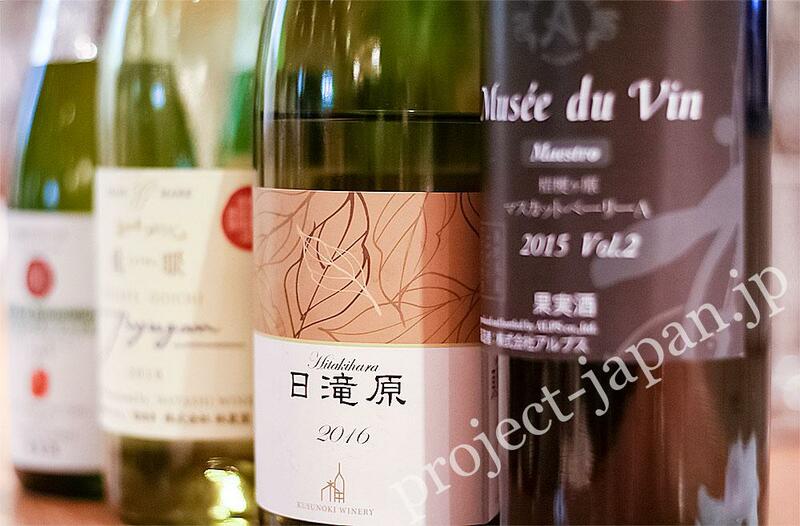 As for the Japanese wine, compared to Europe and America, since the history of cultivation of grapes is shorter, there are not so many complete full-bodied wines. So, not many wines are good for storing for a long time, but some wines are very excellent. For example, some wines made in 2001 produced in Obuse Winery, which grapes are cultivated almost without using agrochemical, have still great potential for aging. Potentials of grapes are reflected in the quality of wine, we have a pleasure of finding the suitable condition for drinking. I also recommend you asking to a professional when is a good time for opening the wine. When you open a wine on an anniversary, the meeting with the wine will be the only occasion. Enjoy the meeting! Which wines match Nozawana (plant food fermented by vegetable lactobacillus) and Oyaki (flat baked flour or buckwheat flour bun stuffed with red bean paste or vegetable filling) ? 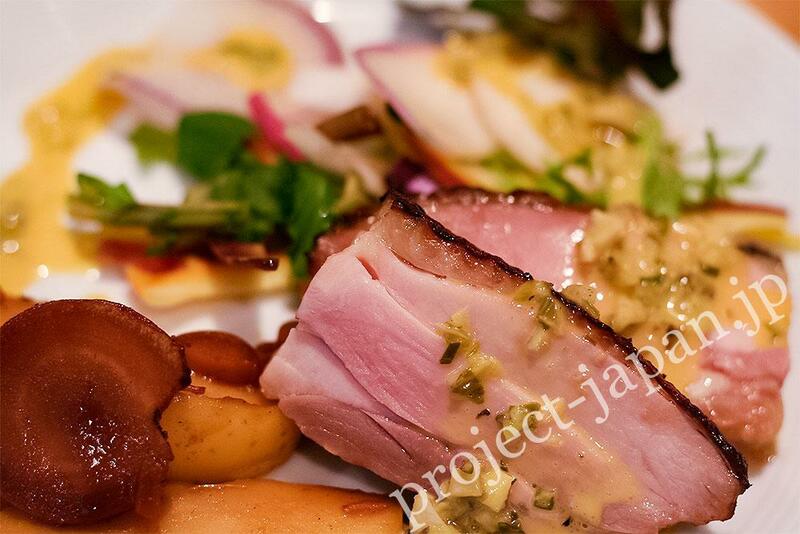 Foods that contains fermented ingredients goes well wines such as Hitakihara very much. Light-bodied wines made from Chardonnay – sweeter and mellower than Hitakihara – may harmonize well with Oyaki or bans, which are made out of kneaded flour and often use miso. I think today’s “Musee du Vin Maestro Muscat Bailey A” is good for Oyaki.